Home » How to extract iPhone contacts from iPhone backup via iTunes? This article explains how to extract iPhone contacts from an iPhone backup made by iTunes. If you Lost your iPhone contacts before backing them up with the above tool, there is still a way to try and recover your iPhone address book. Run iTunes and connect your iPhone. Wait until iPhone appears within iTunes; then click on the iPhone icon. From the “Summary” screen click the “Restore Backup…” button. 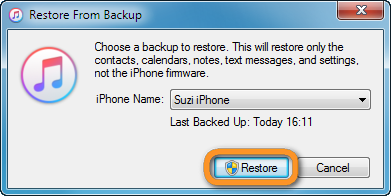 If there are more than one backup entries, select the one that you expect contains the contacts and click “Restore”. Note: Select the iPhone contact entry dated before you lost access to iPhone contact list. Warning: restoring iPhone contacts from backup via iTunes will delete any media tracks currently existing on your iPhone and will overwrite contents on the iPhone with the contents from the iOS backup file. If you want to avoid overwriting your data, you can restore just contacts from your backup with CopyTrans Shelbee. After the restore is complete, you will have your original iPhone contacts recovered. The process might also restore other data you might have previously deleted such as messages, notes, apps, etc. Make sure iTunes is not running, start CopyTrans Shelbee and connect the iPhone. Click “Restore” if you want to do a full restore or “Custom restore” if you want to restore just contacts. Click the green pencil button. A new window opens with a list of all your previous iOS backups made by iTunes. Select the iPhone backup you’d like to restore. For detailed instructions refer to the custom restore guide.